This infrastructure will double the airport’s current capacity and will allow the arrival and departure of up to 72 airplanes every hour, which means more flights to Malaga. Malaga airport will become this summer the fifth in Spain to have two (or more) runways. Aena predict that the opening of the new runway will be in June, and for this to happen, there are still a few matters to resolve like culminate the certification process of the facilities; make some improvements; culminate the staff’s training and carry out the final tests, according to the information provided by this institution. The EASA (European Aviation Safety Agency) is currently finalizing the mandatory inspections, that check and verify the condition of the runway, the procedures and their implementation to allow its opening. This phase officially began in August last year and is absolutely compulsory to be able to start to operate. According to their sources, all tests are resulting positive in the main lines, although minor deficiencies were detected, basically in the signs, for which they immediately assigned a series of actions to amend them. The process is at quite an advanced stage, and proof of this is the existence of a recent document by Airac (the official bulletin of airport activities), that warns the companies, pilots, air controllers and administrators of the imminent implementation of this resource. The start of the operations was initially predicted to set off in May, although Aena then explained that this date was only suggested as a guide for the airlines, that must carry out certain changes in their flight operations. This advert already describes the features of the RWY (acronym for runway) 12/30, that is its aeronautical code, with all the details about its signage and illumination; systems of communications and radio-assistance for the navigation and the landing. Furthermore, it provides information of the new procedures of departures, arrivals and approximation to Malaga. Once it opens, the plan is to start using it gradually, little by little, and depending on demand, to start putting the new procedures into practice, according to the airport’s sources. In fact, in February, a series of changes to the current operations were carried out, in order to adapt to the new scenario of an airport with two runways, and from that moment in certain aspects they are working as if both were operative. For practical purposes, as soon as it’s fully functioning, up to 72 aircrafts will be able to land and take-off every hour in Malaga (there are 37 now); this means, one every less than two minutes. Alongside the T3 terminal, this will allow to transport up to 9.500 travellers every hour (30 million a year). This provides a huge margin for the increase in number of destinations as well as in number of flights and will be a key factor for the touristic development on the Costa del Sol and surroundings. Malaga airport will be the fifth airport in Spain with more than one runway, after Madrid with 4, Barcelona with 3, and Palma de Mallorca and Gran Canarias also with 2. 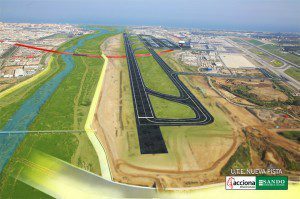 The second runway will have the shape of a ‘V’, at 14 degrees from the current one, between the terminals and the Guadalhorce river. It has cost just under 400 million euros and the building works started in August 2007, on a surface of almost two million square meters. It has a length of 2.750 meters, and another 340 meters at the end for the departures of aircrafts of maximum capacity. It’s equipped with a taxiing-lane parallel to the runway, four access lanes, six exit lanes and two connection lanes to the existing runway. As well as a parking platform for 27 aircrafts. Situation: In a ‘V’ shape, at 14º from the current runway, in between the terminals and the Guadalhorce river. Operative capacity: It doubles, going from 37 to 72 arrival and departure operations every hour. Travellers: It will reach 9.500 by the hour. Duration of the building works: Began in August 2007. Length: 2.750 meters, plus another 340 metres at the end.